Here are some security tasks I’ve been tackling lately. 1. 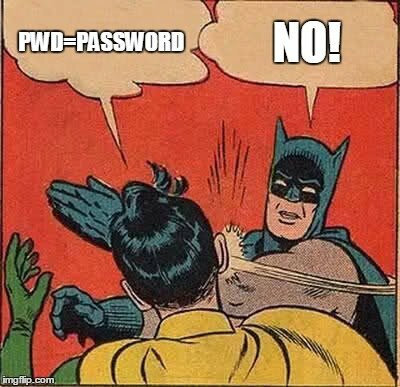 Find weak passwords and change them. I keep track of application logins and passwords using a product called KeePass. It has a plugin called strengthreport that you can use to make a report or .csv showing the strength of your passwords. Use the SVN command to checkout that code to a local directory and then copy the StrengthReport folder to wherever you have KeePass installed. Restart KeePass and under the tools menu, you find a few new entries, all labeled ‘Create Report’. Pick one, they all seem to do the same thing. Then generate a report and send to .CSV. You can filter on the ‘Basic Strength’ column or you can create a column with a single number in it to sort on. You could do that all in one block if you’re a fancy sort of excel wizard. Now that the easy part is done, you can start working with developers to pump these passwords up. 2. Set policy on logins so that they abide by Active Directory rules on complexity and failed attempts. You can enable CHECK_POLICY on your logins by running some similar code to what is shown below. The logins do not unlock themselves after the cooloff time defined in AD. That’s not great. Also, instead of clearing the ‘locked’ box on the login, just disable and re-enable CHECK_POLICY for the login (enforce password policy). This will prevent having to change the password, which will in-turn, stop developers from hating you. 3. Make sure logins are created properly in the future. In KeePass, you can define an autotype template for each folder of logins. This means you can do something like this and variables will be substituted into the template, providing you will a quick way to create users. Just create the login in KeePass, click into a SSMS window, switch back to KeePass and CTRL+V to make that code jump into SSMS. You can also handle this is with a SQL Server Management Policy using the login facet and the PasswordPolicyEnforced property. That’s the way to go! I was looking for a code example of this on the web, but couldn’t find it, so here it is. You would need to create the @cmd of course with your own variables. Here is a bit of code, adapted from Nigel Rivett’s original. You can use this to copy one database over another or restore the most recent database over itself. WARNING: Use caution in running scripts you find on the internet. You are responsible for the well being of your systems! We’re sitting around waiting for the SAN monkeys to fling some crap our way – not the SAN guys, the SAN monkeys, kinda like gremlins, but not as bad. Our primary cluster is down, which runs 100+ databases. Maybe the disks will come up – or maybe they won’t. Assessing the situation, I found that the MSDB was not in full recovery mode. People, please don’t run around changing DBs to simple to ‘save space’ without thinking the ramifications through. In this case, we lose all backup history so we now need to figure out what backup file is the most recent and then which log files come after that .bak file – then we slam them together into a file, leaving the NORECOVERY clause off the last log restore statement. If you think I’m doing this by hand, you’re crazy. We make an assumption here. Each file holds only one backup set. This is how we do our backup files, so I’m OK with this assumption. #We get a list in the output of emtpy directories. $LogRestore = $LogRestore + "
So now we’ve got a SQL statement with all these restores compiled together and separated with GO statements. Pretty neat. I’d probably run small blocks of them and fix any issues the script might have. This cursor inserts all of the roles and members from each database into your admin database. Oh no! A useful cursor?